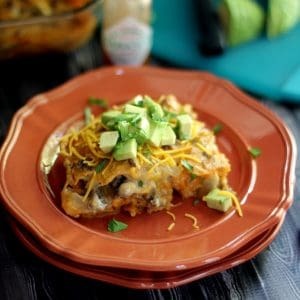 It’s nothing fancy and it’s not difficult to prepare but each and every bite of this Enchilada Casserole is absolute perfection. It comes together easily as you simply layer everything together – taco flavored tortilla chips, ground beef, an enchilada sauce mixture and cheddar cheese. This is it. The dish I request each and every time I go home to visit family and the one that I ask to have for my birthday dinner. My beloved Enchilada Casserole. It’s nothing fancy and it’s not difficult to prepare but each and every bite is absolute perfection. 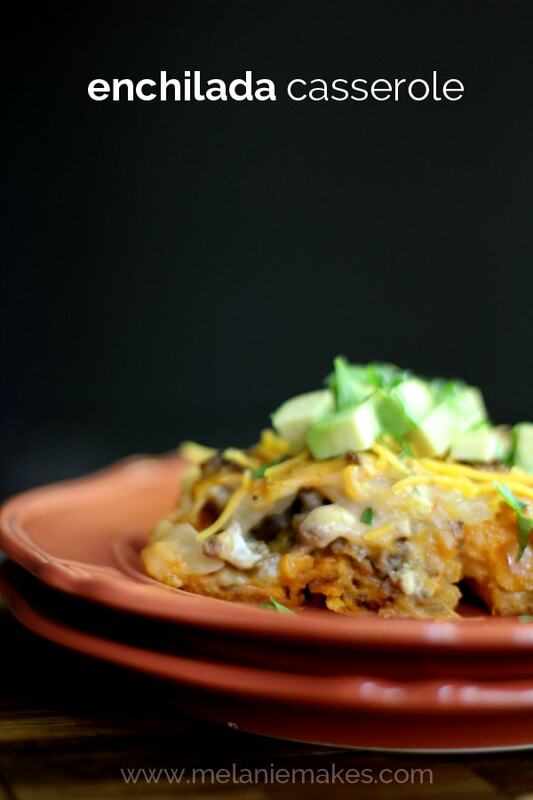 This casserole comes together easily as you simply layer everything into a 9×13 pan – taco flavored tortilla chips, ground beef, an enchilada sauce mixture and cheddar cheese. Speaking of ground beef, it’s one of my favorite cuts of beef to stock-up on when it goes on sale. You can use it for a plethora of recipes and it’s so hand to have on hand. My trick? I grocery shop early in the morning, usually after dropping the girls off at school. I’ve discovered this is when the grocers marks down packages of meat that are getting close to their sell by date. I love being able to pick up large packages of lean ground beef at a reduced price. Once I arrive home, I then repackage them in one pound increments, label them and pop them in my freezer for use at a later date. Budget conscious and delicious? Winning! This isn’t the prettiest recipe, but I’ve discovered sometimes that the least gorgeous dishes are often a diamond in the rough. I took matters into my own hands and simply topped my slice with diced avocado and more cheese to make it look more photo ready. I also love to top mine with hot sauce for some extra heat. Over medium heat, brown hamburger and onion in large saucepan. In a medium bowl, stir together chiles, soups, enchilada sauce and milk. In a 9x13 pan, cover the bottom with a single layer of chips. Top with half of the meat and onion mixture, 1/2 of the cheese and 1/2 of soup mixture. If desired, top with additional cheese, diced avocados or hot sauce. 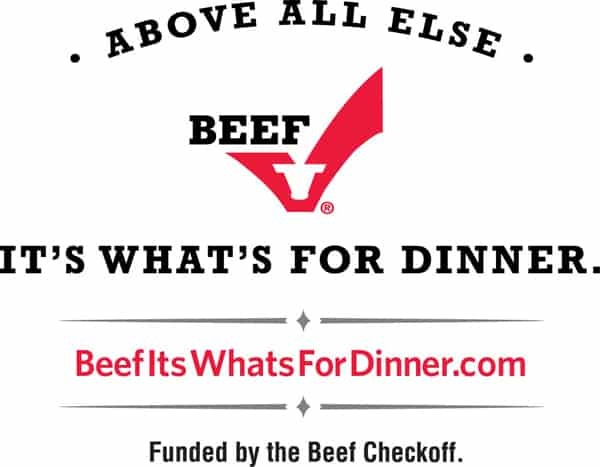 Connect with The Beef Checkoff on Twitter, Facebook, Pinterest and their website. Looking for additional recipes featuring beef? Follow this Pinterest board for more ideas. Wow! I love this- looks delicious and perfect for weeknights and football season. Definitely a great way to feed a crowd, Christy! Oh yessss this is pure comfort on a plate!! I love it! Thanks, Bobbi - it is indeed! I love the simplicity of this comfort food dish. What a compliment, thanks Lori! Love that the dishes are done before it comes out of the oven - win, win! I just love a good mexican casserole for dinner. This one sounds really easy and good! My step dad would LOVE this! he basically loves anything that can go into a tortilla or anything enchilada inspired! Pinning this to make for him when he visits! Let me know if you give it a try, Amanda! Why I have I not had this in my life? All the flavors of enchiladas but so much easier and faster to put together! What a great idea! Sundays need to be easy - adding this to my list! Thanks so much, Marye - let me know if you give it a try! Melanie this looks amazing!! 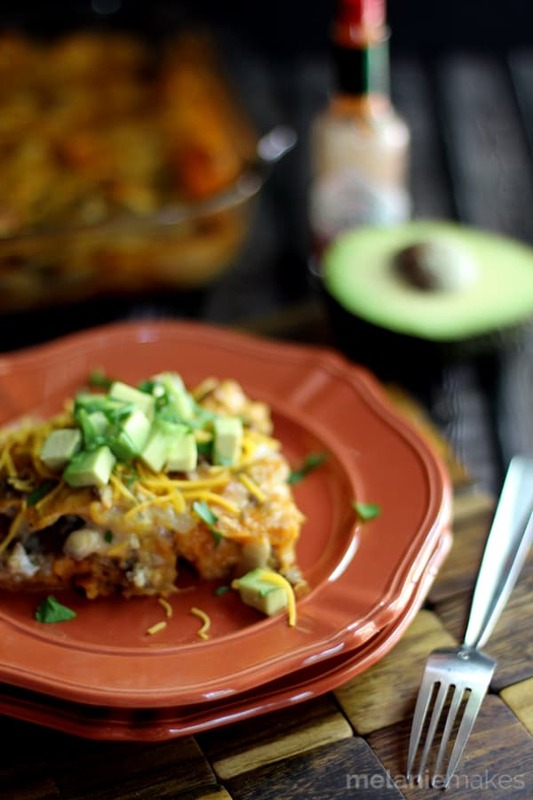 I love anything casserole and anything enchilada :) Pinned! Yum! It sure looks beautiful to me! YUM! I love anything casserole. This looks fab. Pinned! You're so kind, Lee - thank you! What a great, easy recipe. Love it! What a great plate of comfort food! You are right, the least photogenic dishes are often the best! Thanks, Brianne! Comfort food + Mexican food = win! 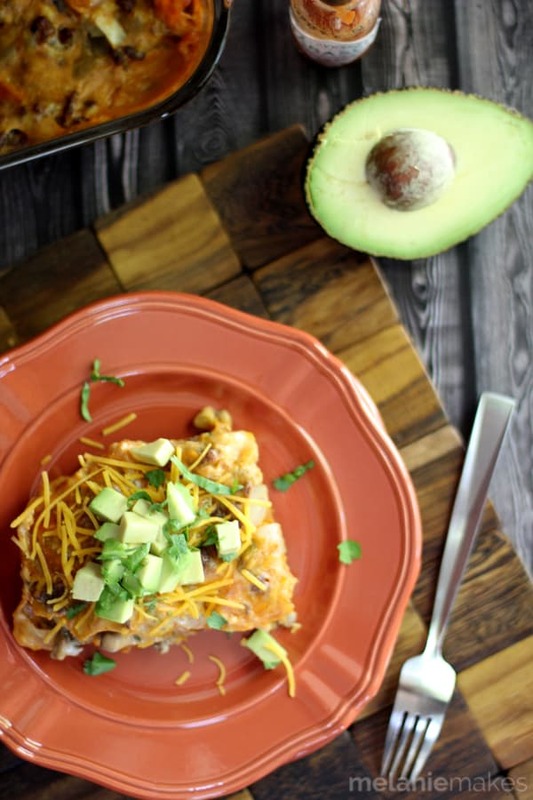 Enchilada casseroles are such a genius idea. Now you have me craving Mexican! I like that you added the diced avocados on the top. looks inviting. Everything is better with avocados, right? Casseroles usually aren't the prettiest plates on the table, but they're always my favorite. This cheesy/crunchy combo sounds perfect! Thanks, Courtney - I totally agree about being my favorite! Enchiladas are where its at. I love that you turned these into a casserole. Nom! I do the same as you (shop early for the markdowns), and when I pick up a marked down package of ground beef that is near the sell-by date, I say, "This is for dinner tonight!" or I will freeze it, as you do. Great tip! Great minds think alike, Dorothy! I am always looking for budget friendly recipes and this one looks fantastic. Can't wait to try it! 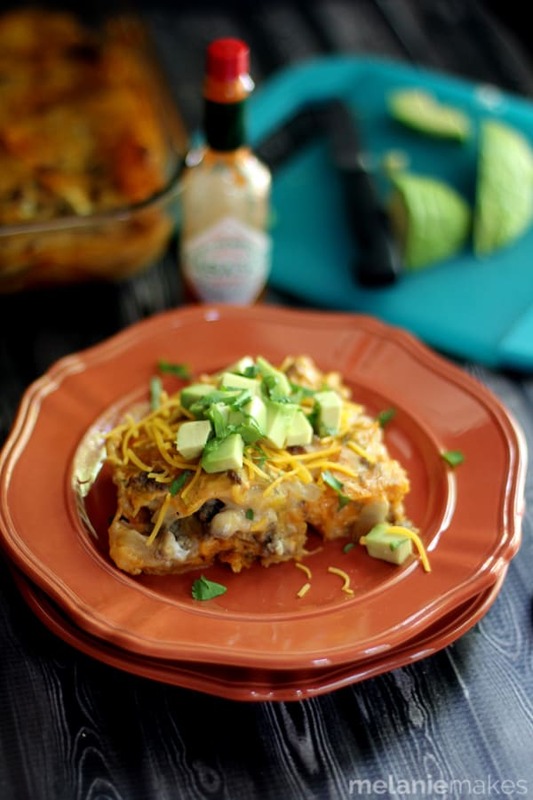 Melanie, this enchilada casserole looks amazing. . I see why this is YOUR birthday dinner dish. . that says a lot and now I like you even more :) delicious!!! I know we'd get along famously, Alice - thank you! I think this looks delicious, Melaine! Tasty too! Great tip! I shop at the same time now and I had no idea! Love your casserole too! Filling yet delicious. Definitely keep an eye out, Tammi! I love serving this with a big baked potato and corn casserole. My family would love this beefy, cheesy casserole! And I love the avocado garnish...scrumptious! Thanks, Liz - let me know what you think if you give it a try! Great tip on how to save money when buying ground beef. And what a tasty casserole too. I've been craving Mexican and I see this happening in my kitchen soon.